William O'neill, founder of Investors Business Daily, has said that, "The whole secret to winning in the stock market is to lose the least amount possible when you're not right." I would agree with that! A good trading system or strategy is absolutely worthless without a method of managing your money. You like to trade stocks right? You like to make money in the markets right? Well, you will not have any money to trade with if you do not follow good money management practices! Your #1 goal as a swing trader is to preserve your capital so that you can stay alive long enough to have some big winners that cover the costs of your losing trades AND make a profit. You accomplish this through a sound money management strategy. Most traders would agree that you should not risk more than 2% of your trading capital on a single trade. The stock market is mostly random. No one else is going to tell you this, but this is the reality of trading stocks. So no matter how good the chart looks, there is a chance that the stock will not go in your desired direction and you will lose money on the trade. How much money will you lose if this happens? On the first of each month, look at the total amount of money in your trading account. Let's say you have $30,000 dollars. Two percent of this amount is $600.00. That is the maximum amount you can lose on a trade. Now let's say that you see a stock that has pulled into the TAZ and is now trading at $25.00. It is looking like it is going to reverse so you decide that you are going to trade this stock. You first have to figure out where your stop is going to be. Do not think about how much money you can make on a trade, think about how much money you can lose if your wrong! I use a trade management software program called TradeTrakker to keep track of my stock trades. Click here to read my review of this software and view screen shots. You determine that your stop is going to be at $24.00. So if you buy the stock at 25.00 and your stop is at $24.00 then your risk is $1.00 per share. Since you have already determined that the most you can risk on a trade is $600.00 then you can buy 600 shares of this stock. This is because if you get stopped out you will lose $600.00, the maximum amount you are allowed to lose. Actually the number of shares that you buy should be a little less because you have to account for slippage and commissions. By managing your money correctly on every trade you can relax because if you incur a loss it will be insignificant to your account. This will also relieve the emotional pitfalls that plaque so many traders. This is only one trade! If you lose money on this trade, just move on to another. If you have a string of several losses in row either stop trading or reduce your position size to 1%. If all of this sounds confusing, you may want to get a money management calculator. I got a free one when I bought Trading Master Plan. There are different money management models to choose from. 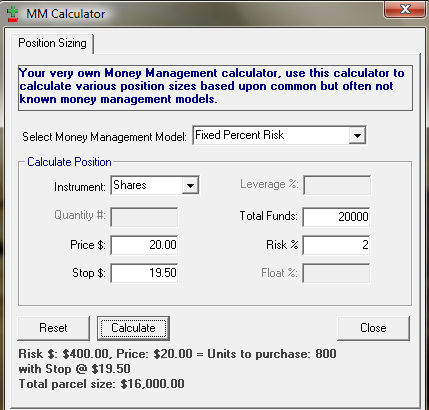 I use the Fixed Percent Risk model. On the right side of the calculator, you would type in the total amount of money that you have to trade with. In this example, we are using $20,000. Under that, type in the amount you are willing to risk per trade. In this example, it is 2%. This calculator is a handy tool to have on your desktop when you want to quickly find out how many shares to buy. Plus, it forces you to become a disciplined trader by only risking a small percentage of your trading capital. And discipline is your key to survival and success as a swing trader. Learn how to use the "2 For 1" money management strategy.